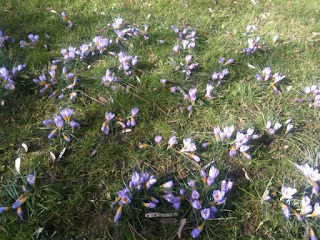 Above is a photo of the first Spring flowers I saw in Paris today. Below is a general letter that builds on my last more personal one, that I will shortly be sending out to the full 1Mandala database. I am happy to announce that the first Spring flowers are blossoming in Paris and... the 1Mandala project is once again starting to roll! As you know, the 1Mandala has been on cruise control since October. Major health issues compelled, me, Russell, the artist, to stop everything and return to Canada. Wow, have I learned a lot. Oneness isn’t just for the outside world, but also for inside oneself. I had to face my inner divisions that manifested in my dis-ease. I have learned that healing isn't an end, it is a process and an awakening. It's about integrating those neglected, blocked-off, shadowy parts of yourself back into the light, back into one. Yep-- healing is about Oneness. The very thing the 1Mandala is all about. In my meditative break, I rediscovered the inspiration to continue the project. You see, the idea of Oneness gets right to the heart of healing the wounds of division in ourselves and the world. In fact, Oneness makes that important connection between the two: as inside, so outside. Now, wiith love, health and insight, I have returned to Paris and I can't think of anything more beautiful to do than co-create a grand mandala to celebrate the growing consciousness of our Oneness on the planet. 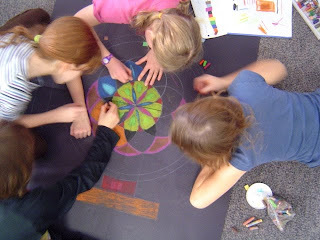 The 1Mandala re-begins with the flowers-- fresh and in new. We will be re-creating the project from first principles in the next weeks. As someone who's been attracted to the project you are invited to be part of the co-creative process. If you find yourself resonating with our vision I invite you to join the Google 1Mandala Co-creation group, follow the process, and co-create with us. Be sure to read the Welcome letter that describes the process and how to join. Spring, and fresh energy is in the air. I've been diligently watching the little green buds that have poking through the dry grass of late. Today, after a morning shower and in the afternoon sun, I noticed the first blossoms. Hurray! It has been a long winter. I smile. As I begin anew with the 1Mandala, a new word is slipping in to my vocabulary. Where before the project was all about "collaboration", now it is about "co-creation". I have been struggling for over a year to discern the difference. I am just now coming to some realizations. First, there is the matter of differing cultural understandings. As a Canadian growing up, 'to collaborate' was a nice thing. The thought brings me back to elementary school, colouring in cartoon pictures with my friends. Collaboration meant to work together with others towards a common goal. I wasn't very good at this honestly. I thought I was a pretty hot stuff with a crayon-- so I would end up finishing the picture because I figured I could do it best. Later on in highschool I blossomed into a monumental individualist. I tried to do everything alone and when others were involved, I sought to wrest draconian control. Thank goodness I learned some hard lessons. I gradually became conscious that working with others is not only a lot more effective, but more way more healthy. In France however, I also gradually became conscious that the word "collaborate" has some serious negative connotations. Ask a Frenchman to collaborate with you, and you will spark an ire that has been simmering for four decades. Les Collaborateurs were of course the French who worked with the Germans during the WWII occupation of France. They collaborated with the Germans and betrayed their county. The resentment continues to this day and contaminates any positive meaning the word 'collaboration' may have had in French. The French translation of the 1Mandala quickly ran into problems as we attempted to communicate this concept. Conversely, the same problem occurred in German-- the word "collaboriert" is hardly used anymore because of the painful war memories that are associated with it. Instead the word 'zuzammen arbeit' is used, which literally means 'together working'. That is a little closer to the meaning of "co-create". In fact, this war legacy that reamains in French and German is the key to the distinction between the two words. "Collaborate" implies working together towards a goal. That goal can of course be good, and bad. But, importantly, it is a goal that unites and focuses the working together. Co-creation is different. The 'co' emphasizes working together. However, 'Creation' is not shackled to a goal. It implies an unfolding, a development. Yes, you are working towards something, but 'creation' emphasizes the process. Indeed, creation is process! It is the means by which the goal is acheived. In fact, if we get existential, 'creation' is the very act of being. Neil Donald Walsh writes about how every moment we are creating, whether we are conscious of it or not. The more we are conscious of the process, the more intentional our creations, and the faster our manifestations. And if we unite together consciously to co-create-- wow! The fact we are giving this concept a word adds another layer of meaning to the word. Co-Creation implies a certain consciousness of the principles involved in manifesting the shared intention. It is a great word to describe the myriad of exciting comming togethers and movements that are now arising on the planet as we expand and celebrate our awakening consciousness. It is a great word to use for the 1Mandala project. 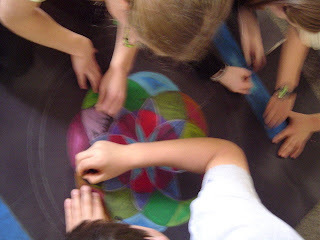 Some photos from a collaborative-- no sorry, a co-creative-- mandala making project with 300 students in Smithers, BC, Canada. It's pretty spectacular what we can learn from kids. After a week of working on this email to my old mandala team I have just sent it out. I gladly share here also with you. It is with great joy that I say… "Bonjour!" This letter is being typed from a light, love and flower filled apartment in Paris. I have just moved into this great moment with my love Abby. After three months of rest, recuperation and healing in Ottawa, my energy has renewed. The last few months have been a difficult time. I had to seemingly abandon my journey, return to where I began, and face some frightening health issues. My return to Canada meant facing some of my biggest fears. Yet, often it is precisely what we fear the most that can empower us the most. I return now with the full support of my family and community. I return with a vast new understanding of my health and how to heal. I have learned so much-- healing isn't an end, it is a process, a journey, an awakening. It is about integrating all the parts of yourself into one. Yes, it is about Oneness-- the very idea we have been exploring together with the 1Mandala. 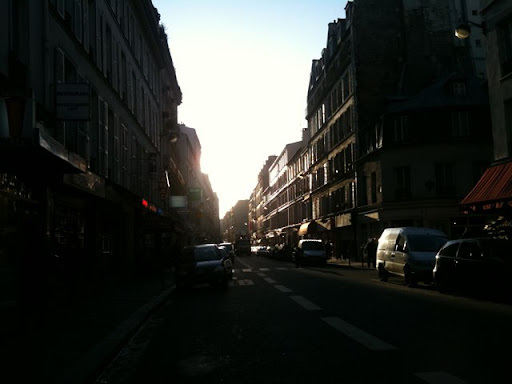 Having returned to Paris, I awaken to find myself with time, finances, love and health. I am doing much better. With these gifts, fresh energy, new insight, and much gratefullness I now turn my focus back to the Mandala project. It has been a long time. I know. The energy has waned. Signups and peace portrait submissions are down. A year and a half was spent labouriously finding our direction. That direction was found, just as the sun set. 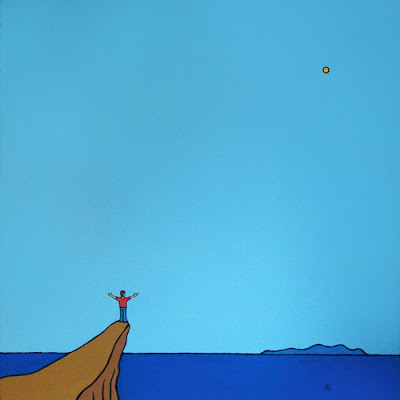 Now, the sun has risen, and we begin anew, with lucid focus, great insight, and a rising tide of energy and momentum. I have but to look back at the magical forces that have brought me this far to know, that it is a tide that will grow and grow into a mighty wave. It makes me shiver at the thought. In weeks, we shall accomplish what it took a year. Over the next weeks I will be leading the process of revising the project from first principles. Right from the begining the process will be co-creative. We will review the project vision, goals, and structure. As the artist it will be my place to lead and moderate the visioning process. Our vision will unfold like a 12 pedaled flower. From a single crystal clear intention, into a six pointed foundation, then into a 12 pronged team of men and women from all over Earth. The vision, the team, and the structure will become a mandala in itself. Joyfully we will create. The plan and the budget will be so beautifully crafted that we can do no other but attract the funding, the people and the resources necessary to manifest the intention. We will be using Google's box of collaborative tools to build the 1Mandala's foundation. I will next be sending you an invitation to join the Google Group. In the meantime, I would like to share a little movie that I created back in Ottawa to apply for a large Canadian artist grant-- you see, ensuring financial sustainabiltiy will be key to harmoniously building the 1Mandala. The 4 minute movie tells the story of the project so far. With that we begin anew. From Paris, I have begun work on the resurgence of the 1Mandala project. Somehow I find my self in a luminous moment to be able to rekindle and recraft the intention. I do so with not a little tepidation-- knowing that each thought we put out creates, I am fully aware that I am putting out some scary big, grand and yes... powerful intentions. 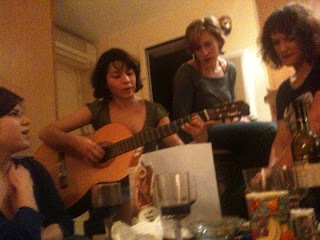 played some great songs (although the photo is technically from another evening of singing-- it was something like that!). What an evening. 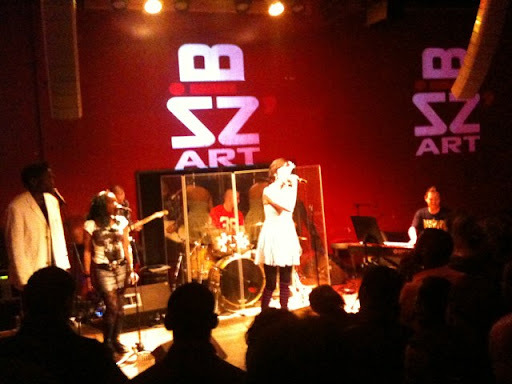 Last night Abby and I caught a R&B Soul Concert Contest. Brune, a diminutive French woman who I met through my 1Mandala presentation back in October, was performing. The last time I had met her, we were both a little under the weather, and we sipped tea in a bar. We talked quietly and politely-- albeit passionately about our art. This time that I met her-- what a contrast! She was dancing and singing up a storm on stage! I really, would never have thought! The crowd voted for each singer using their cell phones. We left before the winner was decided. Brune's comment on winning stuck with me: "The results don't matter. I've already won. I did this for me. The fact I did it is what is important". And she did it! Brilliantly. There were some great singers, fantastic musicians and songs, but her stage prescence was by far the most engaging and electrifying. The prescence of singing from their heart, the prescence of someone doing it for themselves. What a great inspiration. If she can do it... wow... Maybe I could be an R&B singer one day! Paris! Here I am. Wandering the streets of this great city, I can't quite beleive that this is where I am living. Quelle vie! Our apartment is surrounded by a vast array of fantastic amenities-- a dance studio, a bakery, flower shop, multiple grocery stores, a wine shop, a butcher, and best of all... fresh fruit and vegetable stands. For a Canadian, its rather overwhelming. In Canada you would need to get in your car and drive to a big mall or supermarket, or walk half an hour through the snow to hit all these little shops. Here, I can do all sorts of FABULOUS domestic shopping within one block. One block! What a crazy transition. Sitting a the dinner table with Abby, after cooking her dinner, doing the laundry and cleaning the house, I can't quite beleive that it is happening. From homelessness to Parissien modern couple all within a few days. I have been sowly adjusting and recovering from the full out frenzy of work it took to get me here from Ottawa. I now find myself, blessed with a dazzlingly brilliant setup. I have a love, flower, and light filled place to set out the re-newed intention for my 1Mandala project. I am now suddenly blessed with time, finances, a beautiful place to work here in Paris, and most of all with love and health. I feel like some storybook knight, who after enduring great trials in a dark valley, has just emerged, equipped with a new found, mighty sword. I will be going about the ressurgence of the project from first principles over the next days and weeks. You can follow and comment and co-create with me as I begin to plant the seeds of carefully crafted intention. My lover and I have moved in to our new apartment in Paris! Wow. What a pleasure to be able to type those words! It was such a great pleasure that Abby and I could not hold back celebrating. 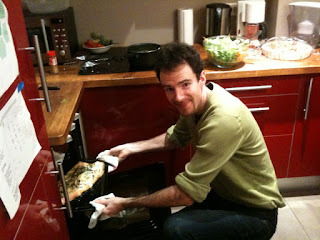 The very day we moved in, we threw our housewarming party! 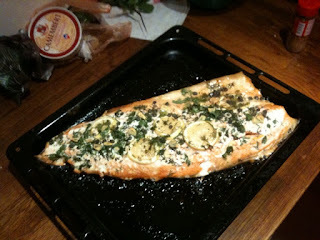 It was a spontaneous celebration of Health, Love and Home. Given the theme, fruit and vegetables seemed appropriate apetizers. As we collected an array of vibrant edibles from the local shops, we were struck by the idea of creating a collaborative mandala. After a frenzied hour of chopping, Abby and I layed out the fruits and vegetables on the table. 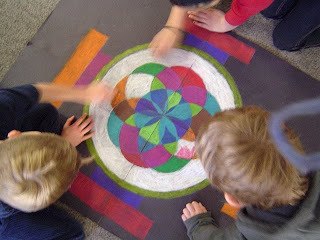 With the help of our friends, the mandala came into being! I attempted to record the creation and destruction of the mandala with photos. Of course, I was also drinking wine and entertaining. Alas, Friends and fun and wine do not combine well with making a coherent stop motion animation! I can't beleive it, but I forgot to remove the excess plates from the mandala table, and I forgot to take an overhead shot! And then my iPhone fell into some lettuce-- hence some of the blurry shots. Yet, I have learned that a creation is better than no creation-- so here it is!